We have private game estate Red Stag hunting for exceptional Red Stags ranging from 330 – 600 class. New Zealand’s red stags carry the biggest trophies in the world, that’s a fact. 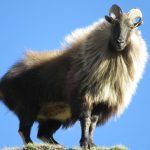 In comparison to other hunting destinations New Zealand’s red stag is our Stone sheep, our desert bighorn, our Marco Polo, our Red Stag is our pin up animal. 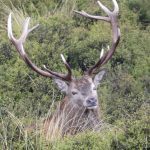 Lake Hawea Hunting Safaris has some of the best free range red stag hunting that New Zealand has to offer. Genuine free range red stag trophies top out at around 280 on the SCI (Safari Club International) score which is the equivalent of around 320 -330 on the Douglas Score (used for measuring free range trophies in NZ). For hunters wishing to take a trophy red stag of 300 SCI score or bigger we have private estate red stag hunting available. The estate has a high fence and is 4,000 acres in size, terrain is rolling to mountainous. We have some vehicle tracks to gain elevation to glassing points; hunting is on foot from there. High quality fallow deer are also on the estate and wild pigs which come and go as they please. Red Stag trophies range from around 320 SCI to 450 SCI, the estate is a beautiful and challenging area to hunt a New Zealand red stag of this size. For stags of 450 and above we utilize another hunting estate which is close by. These red stags are truly giants weighing in at around 400 pounds in body weight, with antler weight up to 50 pounds. Private estate Red stag hunts are available from early February when the stags are stripping their velvet until late August when the stags shed their antlers. Best dates to hunt are March / April / May, the main ‘roar’ period being in March and April.